Healthcare experiences are often complex and frightening, however the environment these experiences take place in can offer calming distractions, if designed properly. One environment that is often high-stress is the Radiology Department. When patients receive an MRI, the experience is often disconcerting, not just because of the claustrophobic nature of its dimensions but also for the diagnosis the MRI might reveal. Putting patients at ease is of utmost importance in these spaces. 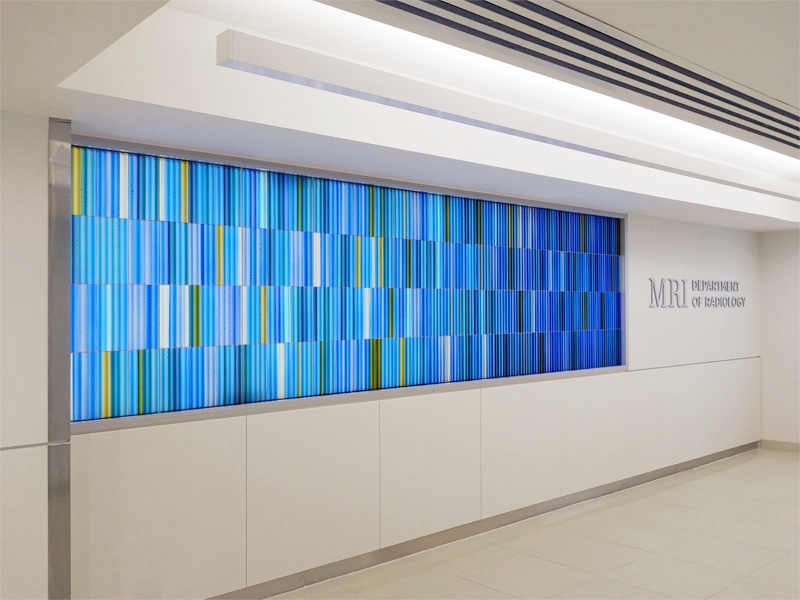 For the Radiology Department renovation at Memorial Sloan Kettering Cancer Center, CAMA and Pomarico Design studio worked together to create a synergistic space that accommodated new technology while also enabling the concepts of patient-centered care. This project, being a renovation, created an added challenge by requiring the desired result to a limited, tight space. Utilizing strong design principles and evidence-based design knowledge, we employed the shifting dimensions of the space (contraction followed by expansion) and coupled it an art installation that utilized color and light. This combination caused the architecture to deliver direction (you have arrived) and then distraction (you forget why you are there). The colorful art glass wall installation entitled, Pleione (pictured below) was created by artist, Paul Housberg. Housberg is noted for his inventive applications of glassworking technologies in architectural settings. CAMA contacted him early on in the project and proposed the application of his work to be placed at the entrance to offer wayfinding, distraction and most importantly, hope for the cancer patients at MSK. According to Housberg, the installation is inspired by images of gene sequencing and the promise of genetic engineering to cure disease. Learn about the technique process of Pleione by visiting Houseberg's website.